Hi guys. So I was aiming to release this next demo asap but because I had more free time then usual I decided to first do a full playthrough as extra testing. Well... I got reminded of the scope of this game. Without testers some area's haven't been properly played in years and thus I found more bugs then I'd dare to admit. So, basically I'll be taking more time to polish things up. Also, performance at places has somehow become a slight issue on my machine (=some dips between 58 and 60 fps). I've implemented a series of improvements, but I doesn't seem to fix much as it's the black box GML engine that already takes up at least 86% of the resources. If anybody want to help test the fps on different machines, please let me know. Sorry, but no demo this week either. The more I test the more I find to fix or tweak. So the current state is that there are still about 6 issues on my list that are noticable to game-breaking (and about 20 that are minor to nitpicky). What I did manage to do was improve the overall performance so that framedrops seem relegated to the largest / most heavily populated area's. (It's somehow quite fun to slowly chip away at such a large problem, learning as I go). I'm glad to see those who actually look back and take care of earlier problems before releasing something to the public. Bugbashing is going great with a huge amount of extra issues solved, but not enough to call it finished just yet. There are still about 10 desert dungeon rooms to playtest before calling it quits. After that I'll stop the testing and just put up the new release. All major and gamebreaking issues I've come across have now been fixed. There's just some visual tweaks left and some minor random stuff (like bombs shattering like glass instead of exploding if you get hit while carrying them). And here it finally is: Demo 20! Please enjoy and be sure to post any and all feedback you might have, so that I can continue to make the game beter for you guys. As for the next steps: I'm still pondering on that. Feel free to weight in using the poll (that I'll add shortly). * The controls can be personalized in the options menu at the start of the game. 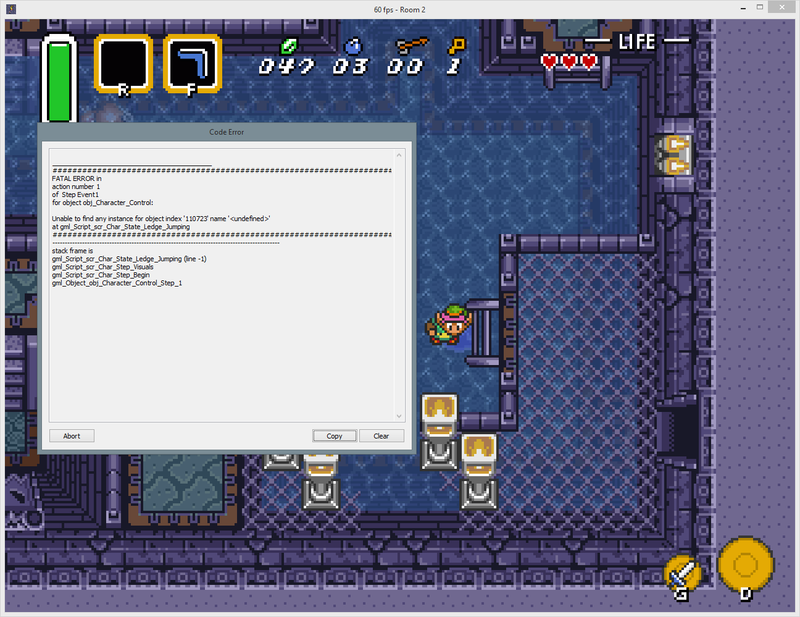 * Dropped back from Gamemaker 2.15 to 2.14, because 2.15 capped the fps to 45 fps regardless of my coding solutions. - Still working on Cucco's. They're so much fun to play around with. - Now also almost fully finished with all the overworld tilesets (finally). This should be the last time I'll ever need to touch those again; fingers crossed. - Added a dropbox download link for the demo. - Made good progress designing the new (placeholder) overworld on paper. I'll likely make implementing those plans the main goal for the next demo, along with trying to improve performance further (as that now has the most votes in the poll). Hello again, still alive out here. So the reason I haven't posted the last couple of weeks was because I was working om trying to get quick overworld done for the NCFC. This weekend though I decided to stop rushing and just skip this years event. It's taking far more time to tile then expected and some rooms are turning out pretty bland and uninspired (also and I'd have to cut a ton of rooms) so I'm just going to relax and take my time again. Btw: if anyone wants to help out with tiling let me know. As for a sneak peak: check the attached images for some work in progress. And yes, I am working on a small light AND darkworld for this next overworld. They'll both be about 12 rooms large and compatible with the mirror item. I'm still alive, but dealing with software development crunch over at work. (=Insurance branch, not game-development sadly ) As a result I haven't found the time and energy to also work on my own project for much more then just a few scattered hours a week. I expect this to continue till around the start of januari, so expect a new true update by then. Finished upgrading to the latest gamemaker version, tinkered around with optimization idea's and I'm now starting back up the overworld tiling. 'Cause this tiling often takes a lot of time I'll periodically share the overall progress (see attachment) for those of you that like seeing something gradually coming together. (As you can see I like to start design pretty abstract like the middle section before implementing it further like the top parts). Just a quicky update this week, as I've only been working on the tiling this weekend. Check the attachment image for the current state. Is that going to be the final overworld in The Legend of Zelda: Horn of Balance? No, this one will also be a placeholder till the final update once every single dungeon is done. Basically development made it far enough where the old quick fix overworld wasn't going to work for that much longer. There wasn't really any greater design behind it yet, in that one. The new world keeps things like dungeon orders, roadblocks, (moderate) sequence breaking and other plans in mind. The tiling process might seem random but it's mainly a creative process to add cosmetics and theming to the functional plans. Also I'll be working a light and dark version of this overworld at the same time. And I'm also connecting to every eventually planned eventual dungeons (a.k.a. "better to plan big now and cut stuff later on in development"). For the next update each new dungeon will just be 3 standard square rooms with some area enemies, a dungeon treasure and possibly the area gimmick. That way players can already try out the macro design of the overworld. And it allows me to also work on end and mid game area's / bosses / etc in the future. All in all I consider this a milestone as I never figured I'd actually reach this point. Check the attached image for the progress on the dark version of the overworld. How will the dark world factor into all this? Mechanicly it'll function as a distorted mirror to the normal world, just like in alttp. I'm adding it 'cause I have plans to also add some dark world themed dungeons, as well as for story and puzzle potential down the line. It's been a while since I tried a demo, so I just played about 20 minutes of the latest (0.20.18) one. I love what I've seen of the new stuff so far! Of course, you know me, so I've got a bug to report. Looks like this bug really upset Link. As you can see in the image, he's beside himself (I can't resist making a bad joke). Page created in 0.071 seconds with 71 queries.